Hi! My name is Clara, I am from Rio de Janeiro, Brazil, and I am currently PLAN’s Fundraising Development Intern. My interest in waste was sparked in my college years and grounded in on-campus waste reduction initiatives, such as move out programs and dorm composting systems. Since then, however, I have put more thought into waste in urban contexts and into the interconnections of waste and social justice, especially in places with limited landfill-diversion infrastructure, such as my home country. The post below comes from a desire to reflect on the different issues that pertain to zero waste beyond college campuses, especially in other parts of the world. While in the context of college move-out programs the trash-to-treasure tag line refers to the transfer of goods between students, in countries where waste-picking is a widespread activity, the trash-to-treasure concept holds an entirely different meaning. With about 400,000 catadores–people living off of picking recyclable materials from streets and landfills– Brazil is one of those countries. There, someone’s trash becomes the basis of someone else’s subsistence. Waste picking is an activity taken up by extremely underserved communities who have few alternative means of earning income. A study (1) of waste-pickers conducted by Brazil’s Institute of Applied Economics Research (Instituto de Pesquisa Econômica Aplicada) showed that catadores are typically young, black, men, who have little to no schooling. While Brazilian illiteracy rate at the time was 7.9%, 20.5% of catadores were illiterate and 73.5% of catadores were considered to be functionally illiterate. These conditions make it extremely hard for these individuals to procure formal employment, and many of them find in waste-picking a way of living. While work conditions for catadores are generally unhealthy and unsafe, waste-picking allows families to keep themselves out of absolute poverty. The same study found that only 4.5% of families were living under the $70/capita absolute poverty line. Average income per catador was found to be only 16% below minimum wage. However dire that statistic is, it shows that people are able to find a somewhat stable income source despite their limited schooling and marketable skill base. The importance of waste-picking in the inclusion of disenfranchised communities can be looked at through the work of Cooperativa Eu Quero Liberdade (I Want Freedom Cooperative) (2), which operates in Rio de Janeiro’s Complexo do Alemão slum. Started by Robson Borges, the cooperative provides income opportunity for individuals leaving the criminal justice system. Borges’ own experience showed him how difficult it could be for an ex-offender to find formal employment. In that trying moment, he found a source of income in collecting garbage and sorting for recyclable material. Through the establishment of a cooperative, he was able to create an avenue for other ex-offenders to become financially stable and stay out of prison. Another fascinating case of the importance of waste-picking for the subsistence of underserved populations is found in Rio de Janeiro’s Jardim Gramacho dump. The site–which covers an area of 1.3 million square meters and is considered the largest garbage dump in Latin America (3)–was the workplace for 1,700 registered catadores (3) and another estimated 3,000 informal catadores (4). Back in 2012, after 34 years in operation, Jardim Gramacho was officially closed as a dumping ground and waste pickers were no longer allowed on the premises. While it is commendable that Rio’s municipal government opted to cease usage of an open dump to send its trash to a properly lined landfill, the impact of that shift on the waste-picking community was not properly addressed. A series of social inclusion policies were presented by local authorities, but essentially weren’t carried through and the community was left to fend for itself. In an environment where the state of disenfranchisement was so severe that many individuals lacked even a birth certificate (5), the challenge of finding formal employment elsewhere is evident. The community has been faced with the emotional toll of the criminalization of their economic activity. Prior to the dump’s closing, waste-pickers were not ashamed of the work they did and understood it to be a dignified income generator. Now, as they search for recyclables in illegal dumping sites that surround the old dump, they work in fear of repression by authorities (6). Living conditions, as showcased by a 2013 study conducted by the South American non-profit TETO (4), are also known for being particularly precarious. Over 75% of families experience rain water coming into their homes, 78% of families reported their floors were constantly wet or humid and 28% of families experienced recurrent flooding in their homes. As a result, individuals, especially children, constantly suffer from diarrhea, bronchitis and skin diseases. As municipal governments adjust to Brazil’s new Solid Waste National Policy, which establishes that all dumps must be put out of use and substituted by landfills, there is an ever-growing need to recognize the importance of waste pickers in Brazilian recycling and create ways to incorporate these workers into new waste management systems. These new practices must guarantee safe and healthy working conditions that bring forth appreciation of their labor, and that are all-around just and equitable. Brazil. Instituto De Pesquisa Econômica Aplicada. Desafios Do Desenvolvimento. “Os que sobrevivem do lixo“. By Carla Lisboa. Vol. 77. N.p. : n.p., 2013. Desafios Do Desenvolvimento. Instituto De Pesquisa Econômica Aplicada. Web. 28 June 2017. Cooperativa Eu Quero Liberdade – Yunus RJ. Yunus Negócios Sociais, 26 Mar. 2015. Web. 28 June 2017. Alves, Maria Elisa. “The Closing of Gramacho, Latin-America’s Largest Landfill, Leaves Garbage Pickers with an Uncertain Future.” O Globo. O Globo, 30 May 2012. Web. 28 June 2017. Macena, Ariel, and Fernando Haddad. “Não Fechou Só o Lixão – Situação Do Jardim Gramacho.” TETO. TETO, 2013. Web. 28 June 2017. Clarke, Felicity. 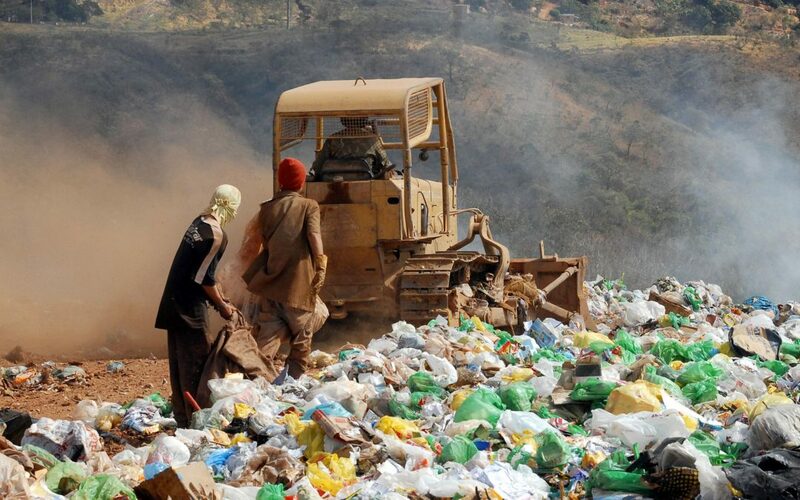 “Waste Land Pickers Struggle from Landfill Closure.” RioOnWatch. Catalytic Communities, 21 June 2012. Web. 28 June 2017. Aquino, Wilson. “Fechamento Do Aterro De Jardim Gramacho Deixou Frustração a Milhares De Pessoas.” O Dia. O Dia, 11 Sept. 2016. Web. 28 June 2017.